There comes a time in every bearded man’s life when they have to think about trimming. Well, unless you’re going for a yeard of course! For some, this is a daunting prospect. You might be worried about trimming too much off, making a mess of what you’ve grown and having to start growing your beard all over again. Now I have to be honest, this could also happen to you. If you’re a newbie to beard trimming, mistakes are likely to occur in the early stages as you experiment and hone your technique. I’ve certainly been there. My early attempts at tidying up my beard were nothing short of a complete disaster! But it’s not all doom and gloom. With time you will get better – I guarantee it. In this blog post, I will help you to get there, by explaining everything you need to know about how to trim your beard. Before you head for the razor, scissors or beard trimmer, there is something else that you need to do first – choose a beard style. Which one you choose depends on a number of things, including of course, your personal preference. But that’s not all you need to think about. Have you ever considered that the shape of your face comes into the equation too? When I first grew a beard, I wouldn’t have believed it if you told me. But now, it’s quite clear that this is the case. Take a look at the below infographic from the guys at Braun for instance. Who would have thought that if you have a square face, you shouldn’t have a full beard?! You also need to think about how much time and effort that you want to put into beard maintenance. For example, a long unkempt beard will require a lot less trimming and upkeep than a neatly trimmed shorter beard. No matter which beard style you choose, there is no avoiding the fact that you will also need to trim your neckline at some point. Why? It will stop your beard connecting with your chest hair for a start, (yes it does happen to some people!) But more importantly, it will make your beard stand out more and help to ensure that it looks more defined. 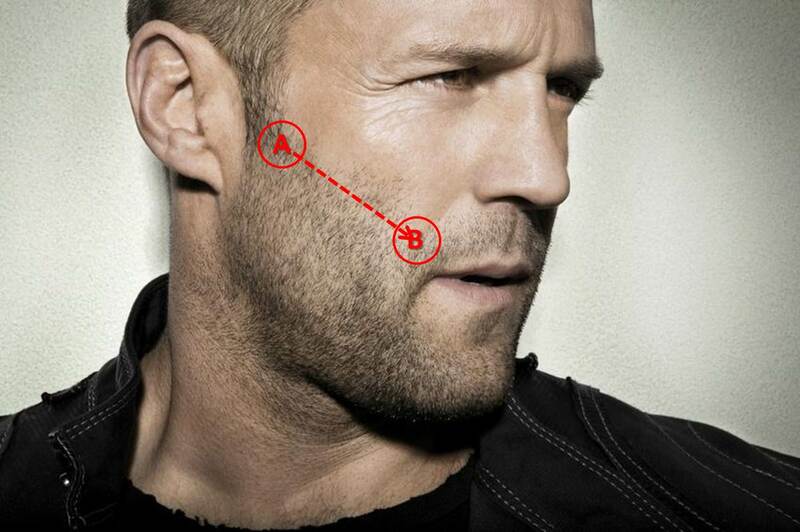 Luckily you can achieve a great looking beard neckline in just two simple steps….and a bit of practice of course! Now that you have an outline, you can simply trim away the hair that falls outside of these areas. Ensure to keep the neckline curved under your jaw to avoid an unsightly and unnatural look. Like a lot of thing beard related matters, there is plenty that can go wrong when trimming your neckline. No-one wants a double chin. But if you trim your neckline too high it will give the false impression that you have one. Not a good look in anyone’s book! Below are images from the guys at Hairstyles on Point that show examples of good and bad beard necklines. The bad ones are way too high and are nowhere near any of the men’s Adam’s apples. The good necklines are clearly much better. They all have a shape to them that appears natural, rather than overly groomed. Most importantly, it curves under the jaw which is exactly how it should be. If you happen to have a longer beard, using scissors is the best way to keep it in check. They give you better control and you’re less likely to make a drastic mistake than if you used a trimmer instead. Scissors are a great way to trim your beard. In fact, it is my personal preference. But sometimes it doesn’t make sense to use them. When you’re looking for a short or stubbly beard the best and simplest option by far is to use a beard trimmer. Start with the longest setting on your trimmer, (see my quick length guide below,) and begin shaving up against the grain, ensuring that you trim all of the hairs. If you go too short, too soon you may end up regretting your decision and there isn’t much that you can do about it at this point! Which trimmer is best for my beard? Now there are plenty of beard trimmers on the market. They come in many different shapes and sizes and you should choose carefully to ensure that you pick the right one for you. Length settings – Make sure that you choose a trimmer that has a large selection of length settings, to give you maximum flexibility over the length of your beard. Cordless or non-cordless – If you travel a lot, it might make more sense to have a cordless trimmer so you can just grab it and go. You don’t have to worry about leaving the charger in your hotel room either! Do your research – This probably goes without saying, but to help your search, you should look at reviews and ask friends for recommendations. All-rounder or basic? – There are plenty of standard trimmer models out there. But if you you’re looking to get more out of your purchase, there are some that contain extras such as pop-up ear and nose trimmers. I certainly could do with the latter! In my instructions above, I mentioned starting with the longest trimmer length and then progressively getting shorter if necessary. Still with me? You’re nearly finished! All there is left for you to do now is to ensure that your cheek line is tidied up. This is very simple to do. Like the image below, you need to imagine a line from the top corner of your moustache to the corner of your sideburns. Once that has been defined, then just trim all the hair that sits above it. Like anything to do with trimming a beard, the key is to start slow. In this case, don’t star trimming too low, otherwise it will end up looking a bit silly. I can tell you this from personal experience! I hope that this guide has been useful for you. It is a lot to take in, but after a bit of practice, you will wonder why you ever worried about trimming your beard. To end this post, I thought that I would finish by providing some tips on how to keep your beard looking its best moving forwards. Invest in beard oil – If you only invest in one beard product, you should make it beard oil. Not only does it keep your beard looking shiny, it can also stop beard dandruff from becoming painful and looking unsightly. Get brushing! – This is non-negotiable. By not brushing your beard, the oil can’t reach the skin underneath, which will mean that it becomes unbearably sore quite quickly. No-one wants that right?! Ask for help if you need it – If you are still struggling to get the hang of beard trimming, don’t worry. There is no harm in going to your local barbers and asking them to do it for you – until you get more confident in your abilities. Whilst you’re there, you should take the opportunity to ask for their advice so you can feel more confident doing it yourself going forwards.